I call Peter Thompson of Ocean Independence on another matter entirely and he tells me that he’s just sold Christensen’s 49.7m Casino Royale. 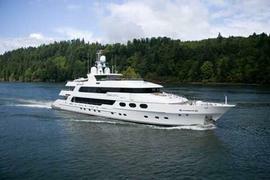 No other broker was involved in the deal and the yacht retains her name. The largest yacht built by the yard to date, she was launched as recently as summer 2008 and is the first in Christensen’s Millennium series. Featuring a full-beam master suite and five guest cabins, Casino Royale was sold with a full builder’s new boat warranty.